The anticipation was all the greater given all the years of mission delays. "To be within one day of it is remarkable, unbelievable and I have to persuade myself I'm not dreaming," senior project scientist David Leckrone said Sunday. "But I walk outside and I see that beautiful bird on the pad (Atlantis) and I see the gorgeous weather, and we're going to get off tomorrow and it's going to go splendidly. I just feel it." Earlier Sunday, meteorologists issued an improved forecast, putting the odds of good launching weather at 90 percent, about as good as it gets. Only a slight chance of rain is expected at the emergency landing site in Spain. Atlantis is poised to blast off with seven astronauts just after 2 p.m. Launched in 1990 amid great fanfare, Hubble was supposed to examine the deepest recesses of space and probe the origins of the universe, reports CBS News correspondent Daniel Sieberg. But a disastrous manufacturing flaw hobbled the telescope's ability to focus, and it became a public relations nightmare for NASA. In 1993, an unprecedented repair mission set out to rescue the telescope … and the space agency's reputation. "The future of the agency, the future of our space program hung in the balance - on the ability of a team of seven astronauts, men and women, to ride to the rescue of Hubble, to repair and restore the vision," Atlantis astronaut John Grunsfeld told CBS News. It worked. And Hubble's been delivering groundbreaking science and amazing imagery ever since. "It went from being perhaps NASA's greatest embarrassment - when they launched it with a mirror that was improperly ground - to perhaps its second greatest success. And I'm saying second only in relation to the Apollo moon landings," said CBS News space consultant Bill Harwood. Now the 19-year-old Hubble needs new batteries, gyroscopes, cameras and other equipment that NASA hopes will keep the telescope operating - at a higher than ever scientific level - for another five to 10 years. Hubble has been left unattended for seven years. It's the longest gap ever between servicing missions, created in large part by the 2003 Columbia disaster. A telescope breakdown last fall led to the most recent seven-month delay. "We have seven years of accumulated maintenance work to do," Hubble program manager Preston Burch said. "So you can imagine if you had a car and you were driving it every day for seven years and never took it into the shop. You would have quite a list of things to do on it." The 11-day mission is packed and includes unprecedented camera repairs. In all, five spacewalks are planned. Because this is the final visit to Hubble, "we're going for broke," Leckrone told reporters. This last repair mission was considered so dangerous in the wake of the Columbia accident that it was canceled in 2004. NASA reinstated it two years later after coming up with shuttle repair techniques and an immediate rescue plan involving a second shuttle, the Endeavour. 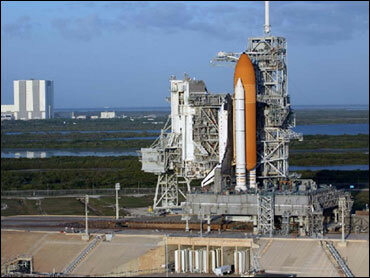 Endeavour is at the other launch pad, just a week from rushing to the Atlantis crew's rescue, if necessary. All of NASA's other shuttle missions in recent years have been to the international space station, where astronauts could await a rescue. The Atlantis astronauts will be unable to get to the station, which is in a different orbit than Hubble. That's why Endeavour needs to be ready to blast off as soon as possible if Atlantis suffers severe damage during launch or by a micrometeoroid in orbit.